JBL Link 20 review | What Hi-Fi? With battery bases available for the Amazon Echo and Google Home, and leather travel cases for the HomePod, there’s clearly a market for products aimed at people who want their smart speaker unshackled from the wall socket. JBL has entered that rather niche market with the Link 20. It’s a Google Assistant smart-speaker that’s small enough to slip into your rucksack, but it also has a 10-hour battery life so you can take it on the go. The Link 20 is about 20cm tall – a little shorter than the Amazon Echo Plus – and weighs a little more than a basketball, but looks a rougher and tougher than other speakers on the market. There’s a 360 degree mesh covering on the speaker, protecting its two 50mm drivers. This helps give the speaker its IPX7 waterproofing, which means it will take splashes in its stride, and can even survive being submerged for 30 minutes. On the top are four buttons: one for play and pause, two for volume and one for Bluetooth pairing. More buttons are found on the back, for power and to mute the speaker. They’re all distinctly marked and easy to use – we can’t fault the Link 20 for build quality. The speaker comes to life with four white lights on the front, similar to those on Google’s own Home speakers. They also pop up when you ask it a question. It’s good to have some form of visual feedback, so you know when your speaker is listening, but we prefer the circular approach of the Amazon Echo’s blue ring because it can be seen from all angles. Finally, at the speaker’s base is a small material cover for the micro-USB charging port for the 6000mAh battery. We leave the speaker to run in over a few days, and are met with a satisfying sound quality. Starting with Lorde’s Supercut – a track with the lyrics layered over Lorde’s own backing vocals – the Link 20 handles the difference in dynamism well between the bolder vocals and the quieter breaths, murmurs and sighs. There’s a good sense of how the intensity changes throughout the track. That’s an impressive feat as the focus with some smart speakers is on the ‘smart’ part while neglecting the ‘speaker’ aspect. It’s a dense production, but the Link 20 manages to separate each instrument with enough nuance. It’s not quite as adept as the class-leaders, and there are times when the song feels more compressed than on other speakers, but for the most part JBL has got it right. Changing track to Childish Gambino’s This Is America, a song that aggressively splices jolly, upbeat melodies and bright choirs with monotone, menacing trap rhythms. Whether it’s the light acoustics, the harsh rattle of gunfire, or the low-frequency rumble beneath the rapping, it’s all kept nicely balanced by the Link 20 with no particular area unduly jutting out. And there’s a good amount of drive and authority in Gambino’s declarations, but there are alternatives available that provide a greater kick. The Sonos One – the company’s Alexa-enabled wireless speaker – has a more decisive take on the song that makes it more lively and enjoyable. While the Link 20 has a decent ear for detail, conveying the wry nuance in Glover’s voice, the small inflections, and rapid intakes of breath, there’s no doubt that the Sonos One delivers it with greater clarity and insight. Similarly, the Link 20’s handling of bass lets it down. It’s not as deep nor as punchy as we would like, ultimately leaving the speaker sounding a little too polite and accepting at times. During our time testing the Link 20, Google Assistant was responsive and accurate. Asking it to change songs, set alarms, tell jokes, and the menagerie of other go-to functions provided by the software company was seamless. But Amazon Alexa and Google Assistant both provide similar functions, so it’s down to personal preference which you would rather have in your home. But merging AI-smarts and portability runs into its own problems: without a wi-fi connection you won’t be able to use Google Assistant, and although this is true for all smart speakers, few others sell themselves on the ability to work outside of the home. That might lead you to consider whether the all-in-one Link 20 is better than the combination of an internet-connected smartphone and a high-performing Bluetooth speaker. This way you can ask Google, Alexa, or Siri to play your music on your smartphone, which can then be streamed to the speaker. However, the downside is that you’re unlikely to get hi-res support that way. The Link 20 can support 24-bit/96kHz streaming (Tidal Masters users will be able to make the most of their subscription) as well as the expected multi-room support through Chromecast. 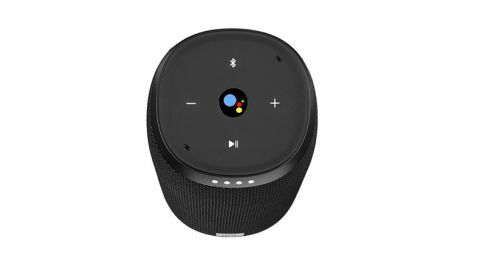 And it can still boast Bluetooth 4.2 connectivity over the Sonos One, which remains a mark against the Alexa speaker. The Link 20 is a fine jack-of-all-trades speaker. Its portability, Google Assistant, and above-average sound quality mean that for those who want to play their music with minimal fuss, JBL has provided an easy solution. It’s not going to be a chart-topper, but it doesn’t have to be. The Link 20 achieves what it sets out to do as well as it can against the limits of the technology, and has taken an approach that we’d like to see from more companies in future.